I've been finding a lot of snake skins but have seen few snakes. This one was quite long (see it wrapped around the bougainvillea in the background). It has been brutal hot the past couple of days with no rain since our big rain on the 17th of June. Today's high temperatures topped out near 100º F (37º C) with high humidity. If I were a snake with no ability to regulate my body temperature I'd probably be shedding my skin too. . . Note: The heat is not why a snake shed's it skin. WHY DOES A SNAKE SHED IT'S SKIN? 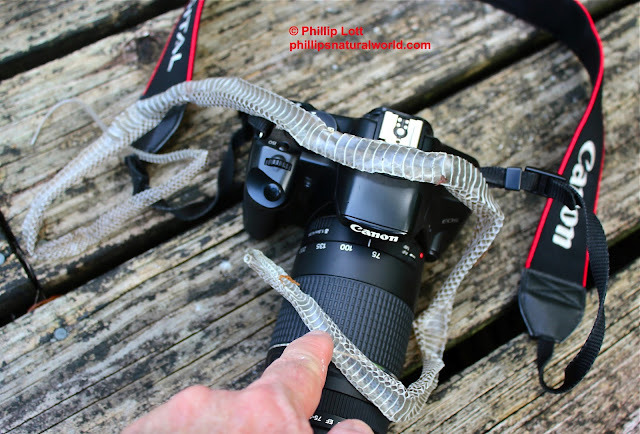 Here I draped a snake skin across one of my cameras for scale. Above I was trying to get a good clear shot of this snake skin's eyes which I thought were really cool. . . I didn't notice the fire ant on the skin . . . and it bit me. Look closely above my thumb near the snake skin's head and you'll see the fire ant. I am constantly being bitten by insects despite my best efforts to keep most of my skin covered most of the time. Fire ant bites are quite painful and long-lasting. The summer solstice is exciting because it means that cooler weather is only about 6 months away for us. The solstice will arrive in about 24 hours on June 21st at 1:04 am EDT. In recognition of the event I took these shots of the setting moon this morning around 1:00 am. 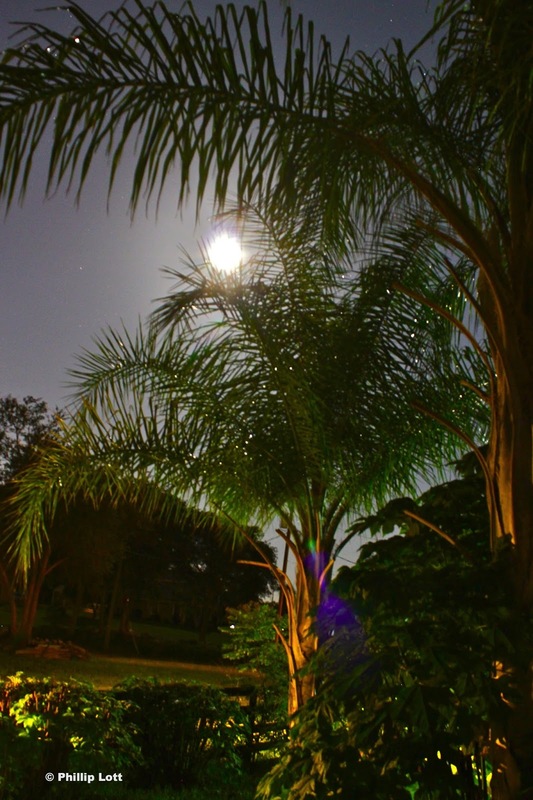 The long exposures make the moon appear more like a sun in the western night sky. I love my seed-grown Queen Palms (Syagrus romanzoffiana) which are now huge trees. They are resistant to heat, cold, drought and flood. The perfect tropical tree for this harsh environment. 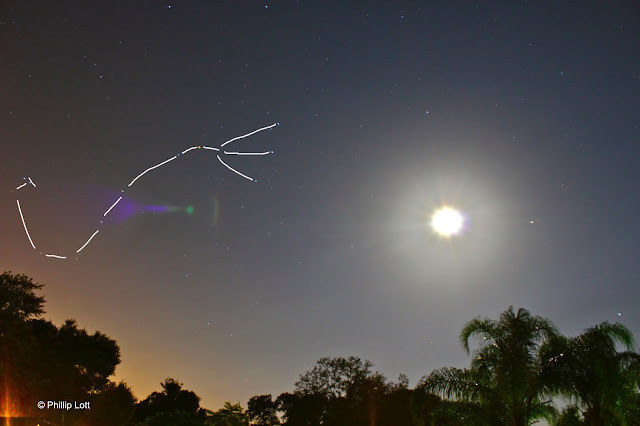 Below: A few stars and planets are visible despite the bright light reflected by the moon. I've labeled the three brightest objects in the western sky. Saturn is the second largest planet in the Solar System with a diameter of 120,000 kilometers. It orbits the Sun every 30 years at a distance about ten times that of the Earth. Composed mostly of hydrogen and helium Saturn's volume is 755 times greater than that of Earth. Spica is the brightest star in the constellation Virgo and the 15th brightest star in the nighttime sky. It is 260 light years distant from Earth. Spica is a blue giant. Heze, also known as Zeta Virginis is also in Virgo. Zeta Virginis is about 74 light years from Earth. It has a luminosity 18 times that of the sun with a surface temperature estimated to be 8,400 kelvins and a size just under 2 solar masses. Below: The ever-present shed light shines bright blue in the bottom right of this image. At bottom left is one of the lights on the fence which emits a more yellow-orange hue. Below, the southern sky glows orange in a long exposure. The orange glow is caused by the lights of the Orlando, Florida metropolitan area to our south. The constellations Scorpius and Serpens Cauda (the tail) are most prominent in this image. Another image looking at part of the southern sky shows the constellation Scorpius. Here I've outlined the general flow of the stars in this constellation. Imagine a scorpion superimposed over that backbone of stars. The orange star to the left of the three fingers is Antares, a red supergiant star and the 16th brightest star in the nighttime sky. Antares is 553.8 light years distant from Earth. Below: Just in time for summer my corn is about ready for harvest. 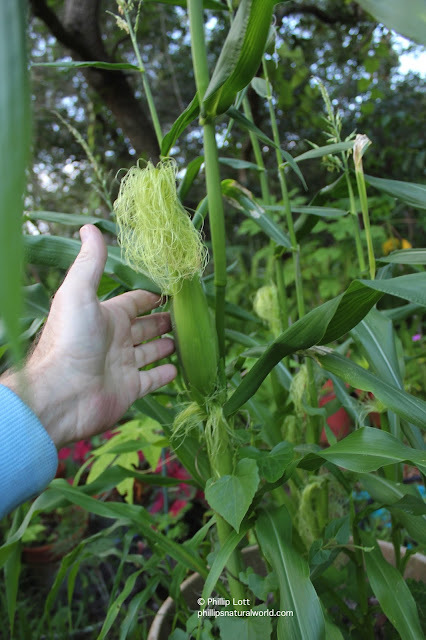 This was a special strain of corn that was designed for southern climates. It grows only about 5 feet tall but makes plenty of small ears of corn. It has done much better than my tomatoes which were mostly a disaster, afflicted by wilt and burnt by the dry heat of early summer.